The state of Kansas announced today that it may not be able to pay its employees on time, and has suspended income tax refunds, reflecting the poor economic conditions facing most of the nation. State governments have been hit hard by the recession, and several are considering plans for payroll cuts and other budgetary reductions. The central bank account for the state does not have enough money in it to pay the bills, so Gov. 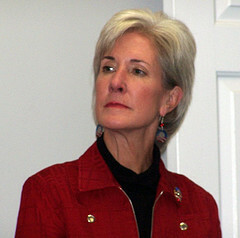 Kathleen Sebelius has proposed that money be moved from other accounts so the states can cover its costs. The move requires legislative approval, and Republican leaders have blocked the move. Without the money transfers, the state may not meet payroll this Friday, when most state employees are due to be paid. The state stopped issuing state income tax refunds last week, and has not released information about when those tax refunds may be issued in the future. Republicans and Democrats are still working out the details of possible internal loans, but no plan has been agreed upon. Other states are also feeling the pinch of the economic crisis, most notably California. In the most current legislative battle in the state, the government is considering cutting $15 billing in spending, including $8.6 billion from education and $1.4 billion from payroll costs. The payroll reduction includes furloughs for 200,000 state workers once a month. The proposal calls for another $11 billion in borrowing and $700 million in tax breaks for corporations. Due to partisan differences, a deal has not yet been reached on the California plan. Gee, Sebelius could come out here and run California. She can’t do any better — or worse! So…because the government can’t budget their money…I have to go without my tax return. I’m so sick of people not working so they can receive government help..which comes from my taxes. Will those people see their “free” money before I receive what is rightfully mine? I’ve seen firsthand so many people on welfare take that money & buy lottery tickets & alcohol while their kids still go hungry. Apparently I’m just not playing the system right. We got ourselves into this economic crisis.